Dinosaurs are ruling the box office again. “Jurassic World: Fallen Kingdom” topped estimates to devour $150 million from 4,475 locations in North America this weekend. While it fell short of its predecessors’ record-shattering $208.8 million launch, the dinosaur sequel is off to a mighty start. 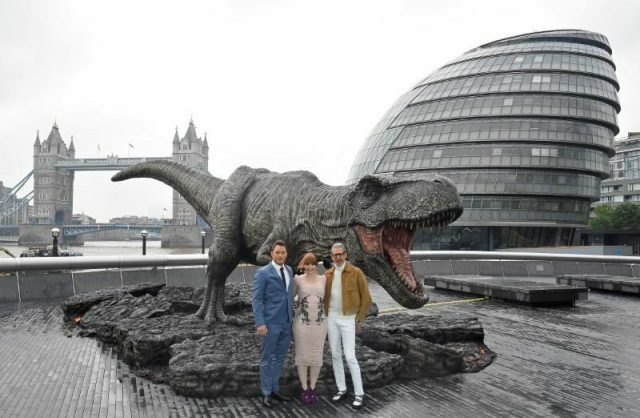 The Chris Pratt and Bryce Dallas Howard-led tentpole has already amassed $711.5 million worldwide, including $561.5 million overseas. “Fallen Kingdom” easily led the weekend as the lone wide release, though “Incredibles 2” enjoyed a heroic second weekend. The Disney-Pixar sequel picked up another $80 million, bringing its domestic total to $350.3 million. The superhero blockbuster, directed by Brad Bird, launched with $182.7 million, making it the best opening for an animated feature and the eighth-biggest debut of all time. The tentpole, co-produced by Steven Spielberg’s Amblin Entertainment, is the fifth installment in the “Jurassic” franchise. The film has received a mixed critical response with a 50 percent average on Rotten Tomatoes and an A- CinemaScore. Moviegoers under the age of 25 accounted for 56 percent of audiences, while 54 percent were males. Of “Fallen Kingdom’s” $711 million haul, $380 million came from 3D ticket sales, along with $105 million from RealD. It also opened on 410 Imax screens, where it brought in $13 million. Meanwhile, “Ocean’s 8” has crossed a major milestone of its own. In its third weekend, the female-led spinoff hit the $100 million mark in North America. The Warner Bros. and Village Roadshow Pictures film pocketed $11.6 million this weekend. Overseas, the heist movie stole $26.9 million for a global total of $171 million. Another Warner Bros. title, “Tag,” landed in fourth with $8.2 million. The comedy has brought in $30 million domestically, officially clearing its $28 million production budget. Rounding out the top five is Ryan Reynolds’ “Deadpool 2” with $5.2 million. The 20th Century Fox sequel passed the $300 million mark domestically and $700 million globally. The original “Deadpool” finished its box office run with $363 million in North America and $783 million worldwide. Elsewhere, “Solo: A Star Wars Story” reached $200 million in North America five weeks in. With another $2 million internationally, the Disney and Lucasfilm picture’s worldwide total sits at $353.5 million. At the specialty box office, “Won’t You Be My Neighbor” pocketed $1.8 million and expanded to 348 theaters. Morgan Neville’s documentary on Mister Rogers, which secured the 10th spot at the domestic box office, has earned an impressive $4.1 million in three weeks. The biopic will expand to 500 theaters next weekend. Thanks to the roaring success of “Fallen Kingdom” and “Incredibles 2,” the box office is 97.3 percent bigger than the same weekend last year, according to comScore. Overall, the box office is up 8.5 percent in 2018. “Notably, the $150 million earned by ‘Jurassic World: Fallen Kingdom’ is more than the $141.9 million generated by the entire marketplace of 105 films (led by ‘Transformers: The Last Knight’) over the comparable weekend last year,” said Paul Dergarabedian, a box office analyst at comScore.